Did you know that you can do window box gardening on your window sills throughout the four seasons, whatever point of the compass they may face? It is possible that the windows of the house can be kept filled with growing plants year-round. 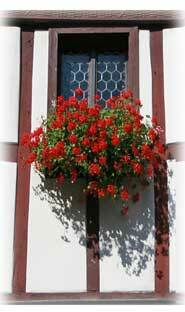 Window box flowers can be a feature of beauty on your home, if well cared for, but an eyesore if neglected. The filled box greatly adds to the cheerfulness and apparent size of the inside rooms under the windows of which it is placed. To make this added feature potentiality a reality, you must learn the conditions necessary for success, and to make these conditions the basis of your window sill gardening. Success in growing plants in window boxes comes from attention to a few simple details of box construction and plant culture. The first question is what kind of planter box to use to contain the plants. Boxes made of wood are, perhaps, most used, and possess many advantages. Window box gardening plants thrive in these; they are inexpensive, and easily constructed of a size to fit the window ledge. The window planters may be painted green to match the color of the vines trailing over their sides, or another color to match the color of the house or harmonize with it. 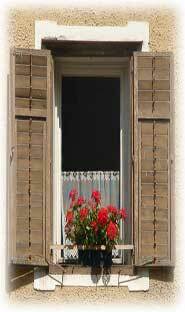 The window flower boxes may be painted and sanded when used on the window sill of a stucco or stone house. For a rustic appearance, cover the sides of the planters with pieces of cedar, white birch branches or bark, or with pieces of gnarled branches or roots of mountain laurel. Window boxes may be made of concrete or cast stone—plain or ornamented with appropriate designs. Some planter boxes are made of tiles arranged in panels, and ornamented with figures of plants in colors. Ornamented tile boxes typically have copper corner and edge pieces. Inexpensive window box gardening planters are often made of galvanized sheet iron or steel. These are usually painted. Whatever material, they should be 6" to 8" or if possible 8" to 10" wide and of the same depth, and of such a length that they fit snugly on the ledge outside the windows. Growing conditions, the amount of sunlight, and the quality and friability of the soil used must be taken into careful account beforehand beginning window box gardening. Since the plants grown in the window box will be confined, provision for perfect drainage is the first essential. Several small holes should be drilled in the bottom of each planter box to provide drainage. A piece of a broken flower pot placed over each hole before the window box is filled will keep the soil from clogging the openings. The gardening box should fill the window-ledge from end to end. A width and depth of 6" to 10" will give good root room and permit the growing of a variety of well selected flowers, foliage plants and vines. Having placed the window boxes, fasten them there so securely that they cannot possibly fall off. Sometimes this is done by using strong steel hooks and eyes. Two eyes are screwed into each end of the box and the two eyes which are attached to the hooks are screwed into the outside of the window frames in such a position that the hooks may be caught into the screw eyes which are in the ends of the box. Another method is to turn a long thick screw from the inside of each end of the planter outward into the upright part of the window frame. When the ledge slants outward, place a strip of wood, reaching lengthwise from end to end, on the outer edge of the ledge, so that the window box, when placed, may stand level. Usually window box gardening boxes in upper story windows are set in iron trays galvanized and painted to catch any water dripping from the planters.